Oxlo and Ford Motor company have collaborated to release a simple auto dealer software solution providing Ford dealers with a web based app that gives dealerships continued access to Ford factory Dealer comunications and eliminates legacy information technology. Certified solution for dealers to receive integrated Ford Factory dealer communications. Elimination of the the legacy Ford VPN at the dealership. Elimination of the legacy Ford Batch Communications Manager software running at the dealership. Access to Ford factory dealer communications using a browser. Meets the needs of ford dealerships that do not use a certified Ford integrated Dealer management System. 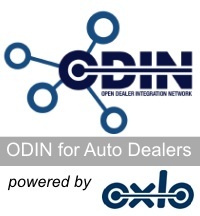 Please complete and submit the contact form to receive access to ODIN for Auto Dealers. ** Must be a qualified Ford dealer.